Google's New Inbox by Gmail : What, Why and How to Use It? What is Inbox by Google? What’s New in Inbox by Google? How to Get Started with Google’s New Inbox by Gmail? Getting irritated with a ton of emails in your inbox? It’s time to get stress-free. Google has announced a free email app – “Inbox by Gmail” for you. Developed by the same team who developed Gmail a few years back in 2004, Inbox by Gmail is not going to replace Gmail, but I’m quite sure that it is well set to provide you a better Gmail experience. Inbox by Gmail, with exciting new and upgraded features of old Gmail is all set to change the way you use email. And I’m sure, its going to make your Gmail more productive. Inbox is a new free email app by Google which has been developed eyeing to enhance your email experience. With multi-platform free “Inbox,” Google is looking to reinvent its Gmail. As we know, Gmail was a replacement of traditional web emails in 2004 -some about ten years ago. But now, its time to upgrade (not replace) Gmail with new Inbox by Gmail. We often get a large number of emails every day. If you had all the time on the earth, then it’s not a big problem. But since you are bound to time and your each second is precious. So it becomes quite tough to take few hours from your hectic schedule and check those emails. And if you got few minutes hardly, it is irritating to go through all those promotional and useless stuff. Even sometimes, we miss some crucial information this way. But Inbox by Google says, NO to all your frustration with emails. Because it has some unique features that ensure you won’t end up missing your important information while useless stuff will be kept aside with less priority. So Inbox by Google is there to fight with such challenges, probably. For example, all your bank statement or purchase receipts would be bundled out to one bundle group; all promotional emails would be listed in another. This helps you stay organized automatically. You would be surprised to know that you can even teach inbox to adapt the way you want to see a group of emails. Highlights are the most useful feature of Google’s new Inbox by Gmail that I like most. This highlights key information from your email. Thus you can easily find important info highlighted at a glance. Surprisingly, this not only highlights but also adds additional info from the web about that particular information contained in email using another feature called Assists which you will learn later in this post. For example, if you booked two flight tickets, one for this week while another for next week. You would get the instant email of booking order completion but this week’s flight order summary would be highlighted and prioritized however next week’s order summary would come later. Apart from this, it might contain some additional information about your flight such as real time status update, etc. Remainders is a so called “Cleaning way” feature of Google’s new Inbox by Gmail. You can organize your to-do lists, and Inbox will remind you for that. For example, set a to-do when to go outside with friends, when to get ready for an important meeting, when to give your parents a call, etc. and Inbox will automatically notify you about it. This is an awesome feature that lets you set your priorities and help you not to miss your important works. 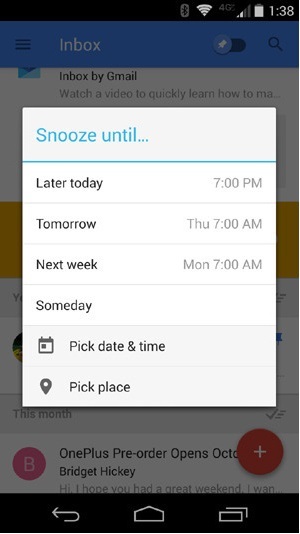 Now you can snooze your emails to see them later. So if you don’t have time to go through all emails, snooze the less important ones to see them later depending upon your choice of setting from later today, tomorrow, next week and most surprisingly, someday -which would show you that mail on any day randomly. Also, you can snooze depending upon your location. For example, if you are in office just snooze the emails to see at home and when you reach home – your location changes, Inbox will remind you about that. This is an important feature of Google’s New Inbox by Gmail that assists you in many ways. Suppose you make a booking for a flight ticket online and assists help you with a link to check-in. Make a restaurant reservation and will provide you map to order summary etc. This is an innovative and unique feature that is missing from many other apps. And this might bring a revolution in app development world soon as developers would be thinking to put such advance feature in others apps too. Of course, there are some similarities. So good news for old Gmail lovers, here I’m going to make you aware of those similarities so that you can quickly switch to the new upgrade. Another way is just ask your friend to invite you, the friend who has already got invitation may invite you easily from his inbox. Remember, you don’t need to create another account as you can download and install the new Inbox app after the invitation and sign in using your any of Google account credentials including old Gmail username and password. Hope you enjoyed reading this post. Did you grab your hands on it? Share your views in the comment section below.